European restaurant opening in Pikesville. Bravo Restaurant, an Eastern European eatery, is preparing to open its doors in Pikesville. The restaurant is targeting a March opening at 1430 Reisterstown Road, previously a Quiznos location. Owner Alla Sandler said the restaurant is ”ready and waiting for clients,” pending a gas line hookup from Baltimore Gas and Electric Co.
Sandler, a singer and musician, has been in the restaurant industry for eight years, most recently as a manager for a similar eatery nearby. Bravo will serve a mix of Russian, Ukrainian, Polish, Belorussian, Moldovan and Jewish cuisine when it opens. Dimitriy Chlobostaev will serve as the restaurant’s chef. “I want people to come to the store and experience the food that they tasted a long time ago, like in their childhood,” Sandler said, noting items such as Russian dumplings (pelmeni) and gefilte fish. ner entrees will start at $15, and Sandler expects the average check to run about $25-$30 per person. Bravo Restaurant will seat about 50 guests in a space decked out with Art Nouveau-inspired decor. 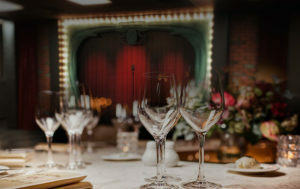 The restaurant will also host live music.